Jean Baptiste Charbonneau was born Feb.11,1805 in present day North Dakota with the help of Captain Lewis and some rattlesnake tail. 54 days later Sacagawea wrapped Jean Baptiste onto a cradleboard, strapped him on her back and they began the laborious journey to the coast. The first part of Jean Baptiste's life was well documented in the journals of Lewis and Clark. William Clark took a real liking to the boy and called him "Little Pomp" probably taken from a Shoshoni word meaning "Leader". At the end of the Lewis and Clark adventure, Captain Clark made an offer to Sacagawea to help raise the boy in St. Louis and to give him an education. Sacagawea took him up on the offer and brought Jean Baptiste to St. Louis in 1809, when he was four years old. By the time Jean Baptiste turned 18 he was living in Kansas City, Kansas area working at a trading post. This is where he met Paul Wilhelm, Duke of Wurttmberg, Germany. The Duke was studying plants and animals in America. Paul Wilhelm was so impressed by Jean Baptiste that he invited him to his home in Germany. In Germany Jean Baptiste learned the language and helped the Duke with his studies. In 1829 Jean Baptiste was back in St. Louis working as a fur trapper and back in the environment he loved. Jean Baptiste had a few jobs in his lifetime, most were in the great outdoors, hunting, fishing and guiding. One of the few office jobs Jean Baptiste held was that of a public administrator and judge in California. He had a hard time in the position, because he didn't care for the way the local ranchers treated the Indians. This job lasted only a year and soon Jean Baptiste was off to find gold in Sacramento, a place he called home for 18 years. The gold bug bit again when Jean Baptiste was 61, and he packed up and headed out to find his fortune in Montana. He never made it however. Jean Baptiste Charbonneau died along the trail at Danner, Oregon of pneumonia. 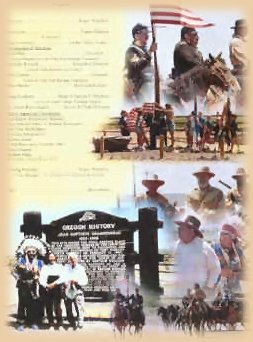 Today, Charbonneau's grave and five others have recently been restored by the Oregon Chapter Lewis & Clark Trail Heritage Foundation, and has been added to the list of famous historical sites.